Well, I suppose it looks like a fairly traditional Sunday roast dinner, but this was a wonderfully spiced up version. The inspiration started with Yotam Ottolenghi’s page in Guardian Weekend and Saturday’s (25.2.12) recipe for Roasted Butternut Squash with Cardamon and Nigella Seeds. With half a butternut squash lurking in my fridge, left over from my risotto on Friday, using this recipe as a side dish seemed an excellent way to go. 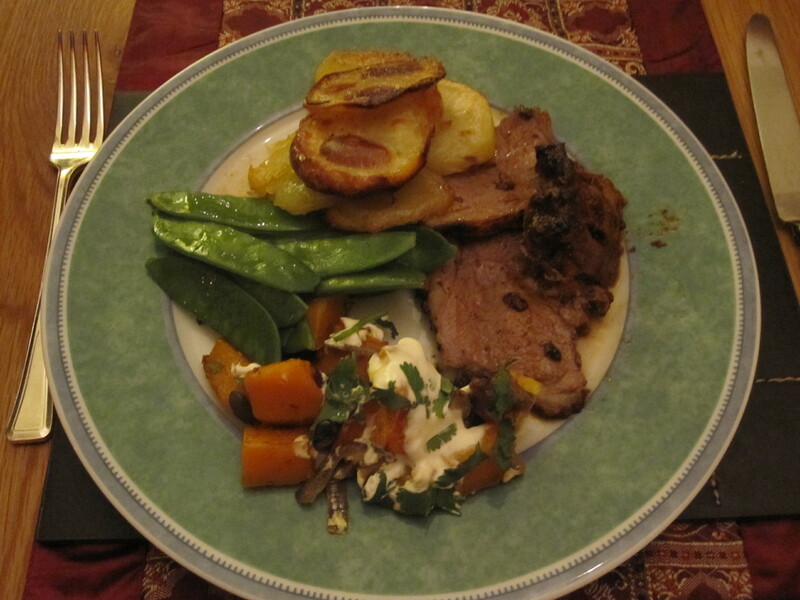 And what better roast meat to go with it than a succulent piece of lamb. 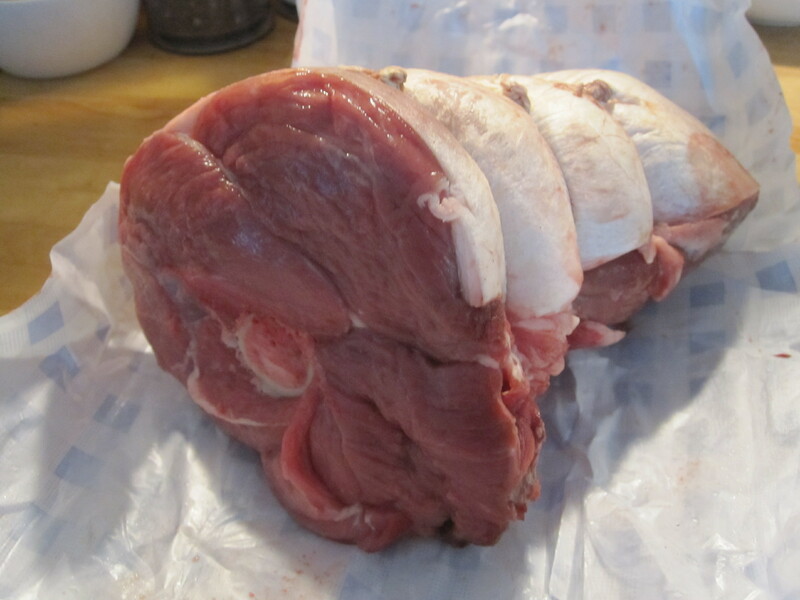 How nice to be able to go up to The Village Butcher on a Sunday morning and have Matt cut me an end from a leg of lamb, just the size I wanted. Getting meat from Matt has become a ‘must’ when it’s quality I’m looking for, but also because he’s so great at offering advice, as he did about buying feather blade steak for my Boeuf Bourguignon a couple of weeks ago. 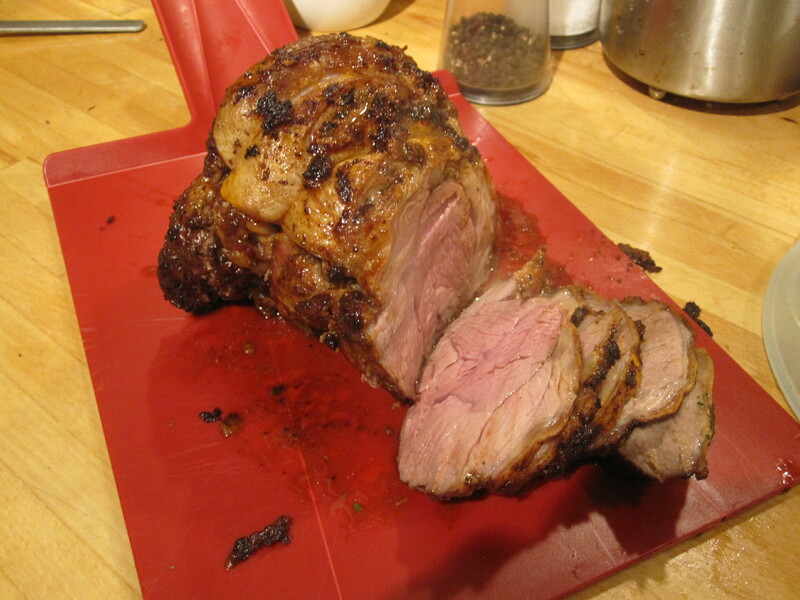 So, there I was with my gorgeous half leg of lamb and although I knew it would taste fantastic roasted simply with nothing more than some seasoning and fresh herbs, I wanted to spice it up a bit. And who better to turn to for spicy advice than the wonderful Moro. So out came my Moro books (see my own Top Ten Cookery Books). These two books have more of those little coloured sticky labels marking favourite recipes than any others in my 200-odd cookery book collection. I decided to go with their Moro Classic Lamb and Chicken Marinade in Moro East. 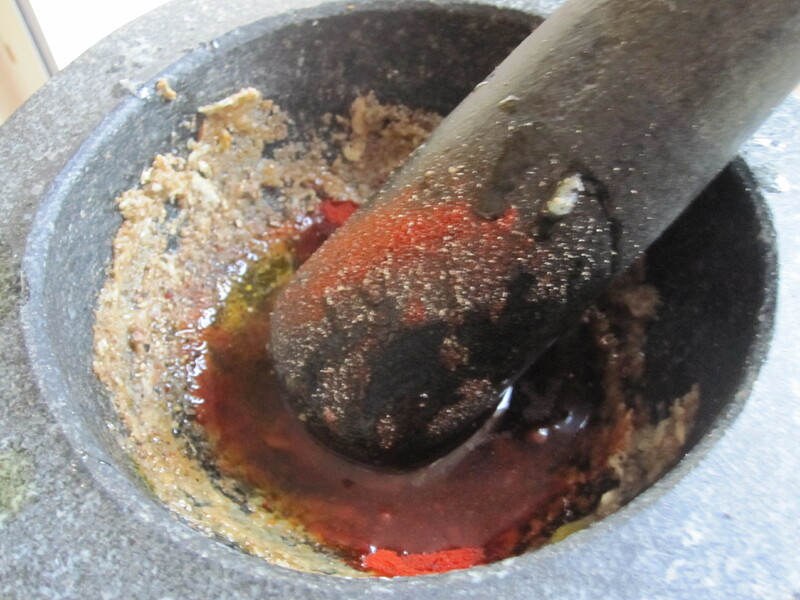 I ground 2 teaspoons cumin seeds in my mortar and pestle, added a couple of fat cloves of garlic with 1 teaspoon salt and crushed together. 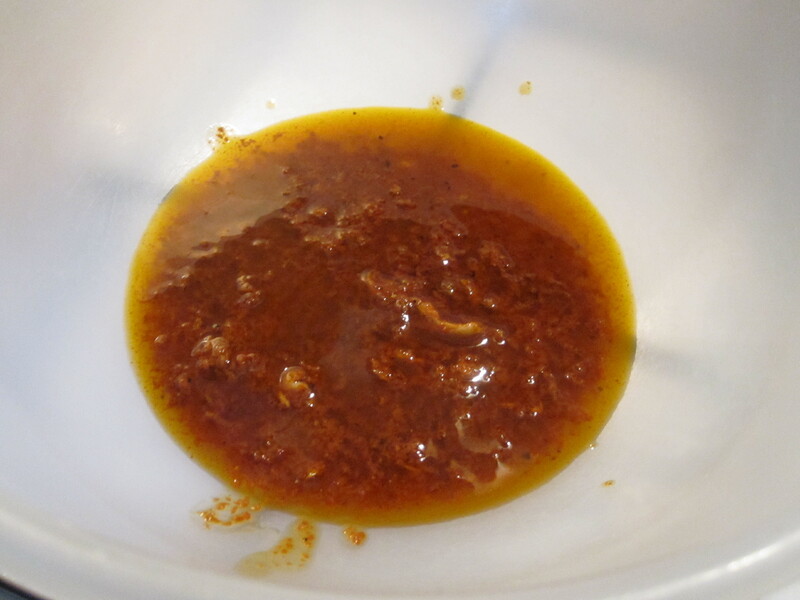 The I added juice of 1/2 lemon, 1 teaspoon sweet paprika and 1 teaspoon smoked paprika. (Moro actually suggest a mix of hot smoked and sweet smoked paprika, but I don’t like too much ‘smoked’ so mixed it with ordinary sweet. You may prefer to follow their suggestion though!) 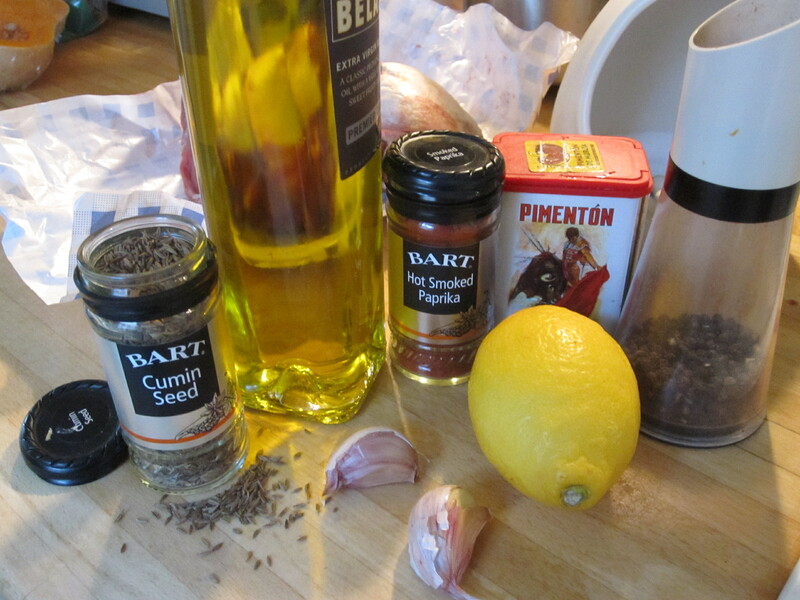 Now add 3 tablespoon olive oil and some freshly ground black pepper and mix everything together well. Transfer the mixture to a bowl which is just the right size to take your piece of lamb. 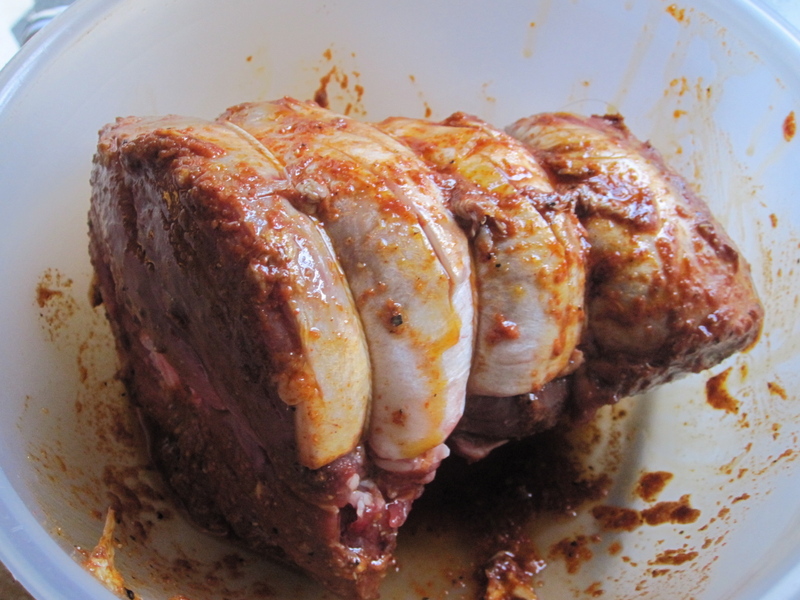 Make a few slashes through the fat on the top of the lamb and then put into the bowl and rub the marinade in well. Leave for at least an hour to take up the flavours before transferring to a roasting dish ready for cooking. My piece of lamb weighed about 1kg and as I like it served pink, I put it into a hot oven (180 Fan) and cooked for just an hour. (Allow time at the end for it to stand for about 10-15 mins for the juices to settle so it’s as tender as can be.) You’ll find the spices will burn a little on the bottom of the roasting pan, but as I wasn’t planning to make a gravy it was OK. Meanwhile, I’d prepared my butternut squash as directed by Ottolenghi and also some potatoes. If I’d had a whole squash I may not have bothered with potatoes but I reckoned Hungry Son would want potatoes too. I thickly sliced some large roasting potatoes and blanched them in hot salted water for just a couple of minutes, then drained and left to dry. About 45 minutes before eating, I put them in a shallow ovenproof dish with a good glug of olive oil and carefully turned them over by hand to coat each slice. I threw in a couple of fresh rosemary sprigs and grated over some black pepper and salt and put in the oven. I also served some mangetout for a bit of fresh greenery, boiling them in salted water for a very short time so they were still quite crisp – and sweet and delicious – drizzling over a little olive oil and squeeze of lemon once in the serving dish. 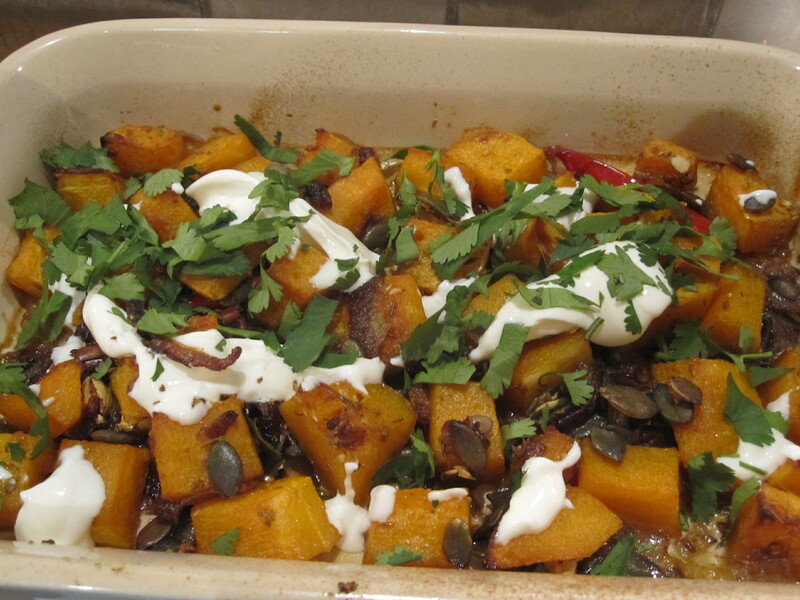 The squash was amazing, soft and sweet and spicy and delicious – thank you Ottolenghi! It married beautifully with the tender spicy lamb; the potatoes cooked this way had a nice caramelised crunch and the little mangetout added a note of freshness. It was a gorgeous supper and shows you can still have a Sunday roast but with a whole new spicy take. Thank you. I’m going to Moro to eat on Saturday … so getting in the mood with all this spicy influence.